Prior to the reforms that the Indian government undertook in the early 1990s, India was known to the world as a country of abundant cultural heritage, but also a country in possession of the irrational caste system, with a vast majority of its citizens living in poverty. My first images of India were not an exception, until I started to gain personal acquaintances with colleagues from India and non-resident Indian friends in 2005. Needless to say, they were the most intelligent, hard-working, even innovative colleagues I have known over the years, their traits foretelling their potential in the long run. After almost two decades of economic and political transformation, India is taking the steps to reach out to its East Asian neighbors. The India-Korea Comprehensive Economic Partnership Agreement (CEPA) was signed in August 2009 between India and South Korea after three years of joint study groups and negotiations. 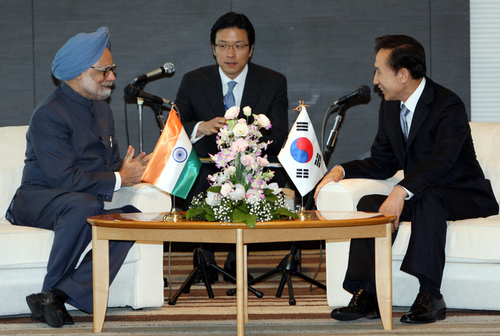 South Korean President Lee Myung-bak’s visit to India at the end of January 2010 ensured the prospects for future development and partnership between the two countries. The CEPA between India and Korea allows 75 percent of Korean export goods to India face no tariff or an eight-year phasing out of tariffs. India’s tariffs on another 10 percent of goods will be phased out after 8-10 years. This joint pact with India will benefit Korea’s major export items – auto parts, handsets, steel, machinery, chemicals and electronics. India has been rigorously engaged in its strategic search for markets abroad. With its both skilled and unskilled workers armed with English language compatibility fast-learning ability and adaptive characteristics, India is more than just an attractive venue for foreign investment. India’s growing middle class is another favorable condition for investment in a developing market. To make these positive factors shine, the steps that India is taking reveal its intent to diversify its markets and also to solidify its linkages to its trading partners: recent efforts are India’s engagements in the SAARC (South Asian Association for Regional Cooperation), establishments of RTAs (regional trade arrangements), and the recent CEPA with the ROK and a forthcoming one with Japan to be concluded within 2010. What makes India so different from China? While China clearly has shown remarkable progress with its rapid economic development over the past decade, India is differs from China in various aspects for its trading partners: first off, it is a democracy, notably the largest in the world. There are cultural affinities in the absence of turbulent history between East Asian countries, albeit its previous domestic unrest and ongoing border disputes with Pakistan. Moreover, Indians’ admirations of the economic miracles that the East Asian economies have achieved in the past century may be one of the sentiments playing a role here. These factors inevitably provide the grounds for open economic cooperation. Another difference is in the sources of economic development. The origins of the FDI flows are important in forecasting whether and from where a country could attract alternative foreign investment. One recent study reflects on the differences in India and China’s economic growth by focusing the sources of FDI flows into the country, revealing that while it was the overseas Chinese that launched FDI in China which led to extensive economic growth, in the case of India, links between domestic private capital and the government allowed for deregulation and FDI liberalization as of late. Regarding FDI inflows from overseas, other scholars have noted on the unchanging trends of FDI into India in the post-2001 period, listing the United States as the primary source of FDI in India. Perhaps with India’s ongoing efforts to widen the range of its economic partnerships, all of this will change in a matter of time. However, there IS one obvious factor in common between China and India: the ambition and the intent to become ‘Asia’s No.1 Best’. While both countries categorized under the nickname CHINDIA will grow steadfastly, economic rivalry at the global and regional level can be foreseen in the coming years. When it comes down to the issue of inadequate infrastructure, different corporate cultures and systems, inherent corruption in the bureaucracy, the question remains on whether India will prove to be the next alternative market for East Asian miracles such as Japan and South Korea. Nonetheless, it is undeniably the most favorable destination in Asia that could serve as an alternative to the Chinese market. Ministry of Foreign Affairs and Trade Reports, Republic of Korea. Shimada Takashi, ‘All about the Mega-market India’ (島田 卓：巨大市場インドのすべて, ダイヤモンド社 ), 2005. Sajid Anwar and Prikshit K. Basu, ‘Foreign Investment and Eoconomic Growth: A case Study of India’, in Anjum Siddiqui eds., India and South Asia: Economic Developments in the Age of Globalization, New York: M.E. Sharpe, 2007.